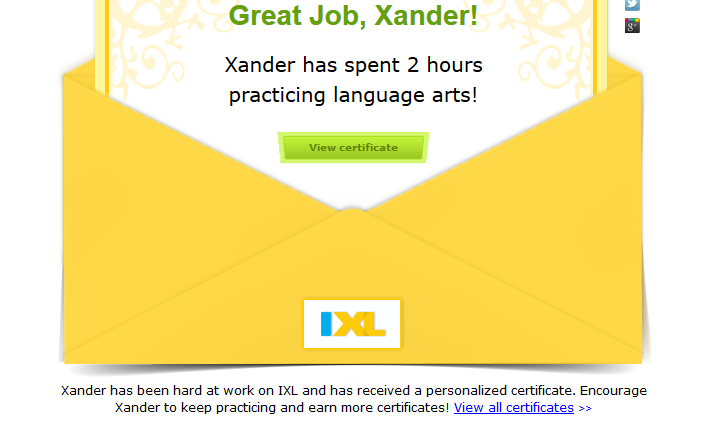 We have been using IXL in our homeschool for the past few weeks. This is a program that helps kids practice in math and language arts areas. This is an online program that offers courses from Pre-K to 12 grade (currently language arts is only offered to 8th). My oldest student has been struggling in Math for quite some time. It is the pre-algebra that has him bogged down. I wanted to be part of this crew review especially for him - so that he would have the extra opportunity to practice. So, he has been using his tablet (which is really more of a tablet/personal computer - it has a full keyboard) to access the site and work for about 10 minutes 3 times a week. Having him work a little bit each day helps keep him motivated to do the work and it not to become boring or overwhelming. He is slowly showing some improvement since starting the program - I believe this is because of the extra practice in his weak areas. My middle son dropped his current language arts program for grammar and has been using IXL at our main computer during this review time. He is only required by me to do about 10 minutes at a time but the reports tend to show a lot more time online working. He tends to work for longer periods because he likes computer work and IXL is a fun way to do grammar for him. I had hoped to use it more for Pre-K for my littlest but unfortunately it didn't work on my tablet and he is better with a touchscreen than a traditional mouse. I'm slowly introducing him to the mouse but he gets crazy and clicks all over. I have a feeling once he gets a hang of the mouse he will be wanting more IXL time because he likes to have computer time like the big kids. I liked this program for math. I think it is really a nice extra practice for my oldest. I'm excited to incorporate more with my little guy when he is just a little more mature (he just turned 4 but he is a young 4). I am happy that my oldest doesn't mind the extra practice and will work willingly. That is saying a lot for a 9th grader. This program has higher maths too - so it will serve us well each year because it will grow with my student. I like to think of it all as a online tutor for math! I loved how this program sent me email reports. That was such a plus! From the email you can print a certificate for your child - I've been printing them for their portfolio file just to have a record of the work they are doing. IXL also sends a weekly recap that shows how your kids are doing overall and lets you see if they actually logged in and did any work. (Helpful with teens who say they did their work but maybe didn't really complete anything. Overall we found this to be a really neat addition to our homeschool day. 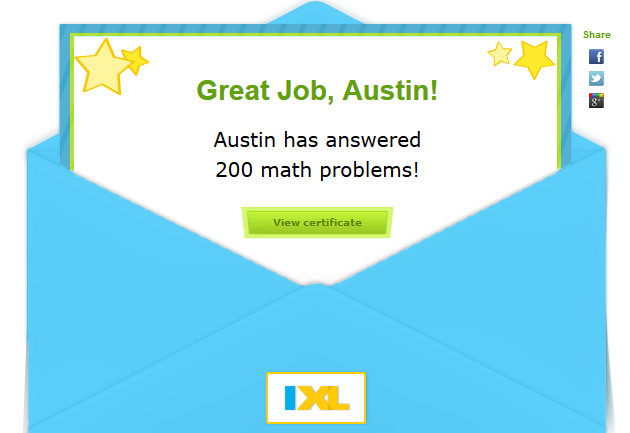 We will continue to keep IXL in the line up weekly for our school.